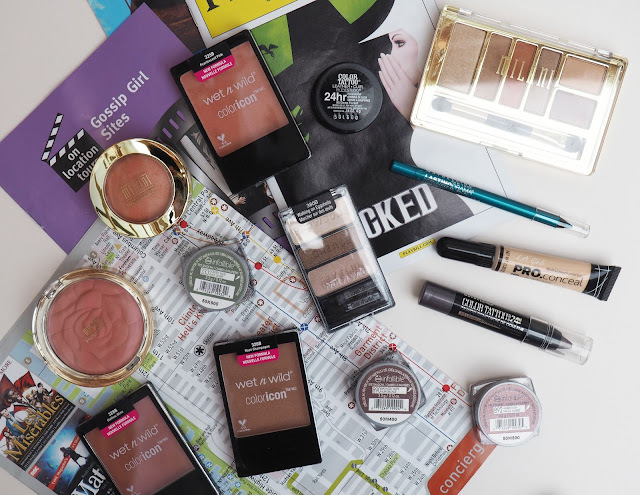 I am SO excited to get this post up, as you can tell by the title its a haul of all the beauty bits I picked up in the drugstores on my recent trip to New York. I had the absolute best time and am now suffering some major holiday blues but getting to test out all the make up I got is cheering me up. I went out there with a looooong list of make up I wanted to get my mitts on and I was successful! Hoorah! Most of this I haven't really used yet so won't be able to give too much of an opinion but if you would like to see a review on anything in particular then please leave me a comment. I went into a bit of a frenzy as I stepped in Duane Reade as so much of the stuff we just can't get here in the UK- very annoying. I knew I definitely wanted to get some things from Wet N Wild as I already have their Comfort Zone palette which I love. I decided to get three of the reformulated Color Icon blushes as the colours looked so pretty, I went with Pearlescent Pink, Rose Champagne and Mellow Wine. Rose Champagne is very shimmery and I think with this you could easily skip the highlighter. The other two are soooo pigmented and I can see myself getting a lot of use out of these shades, I really hope they last well on the skin. I also picked up the Walking On Eggshells eyeshadow trio too, I had heard that two of the colours were similar to Mac Naked Lunch and Mac Woodwinked which I completely agree with after seeing them. Milani is another brand that we can't buy in the UK so of course I had to get some of the products I've heard people rave about. 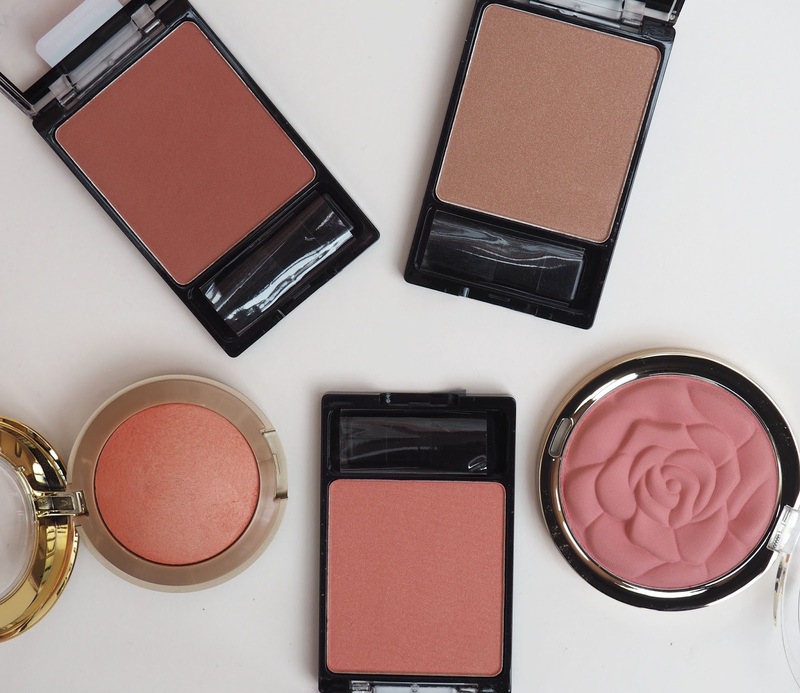 I got two blushes, the first is the Powder Blush in Tea Rose which comes in the cutest, embossed rose pattern and then I also got the famous Baked Powder Blush in Luminoso. Kathleen Lights has talked so much about the Earthy Elements Everyday Eyes palette and when I saw it I just knew I had to buy it, I was so drawn to the orange, rust shade. The pigmentation of these looks really good so I'm excited to start testing them, these colours will look great in the warmer months. 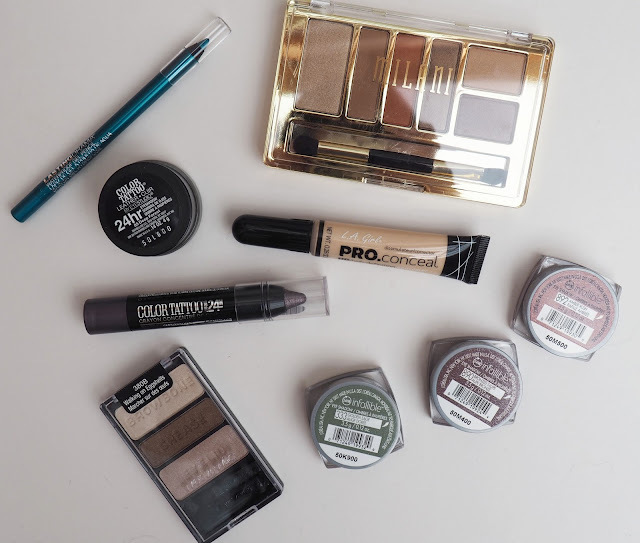 From Maybelline I picked up a few eye products as I haven't seen any of these on the shelves at home. The first thing I got was one of the Color Tattoo shadows, if you read my blog reguarly then you'll know I have a love affair with these, so I was pleased to see a colour that was new to me. Deep Forest is a deep, murky green which I find really appealing so I'm hoping this is a good'un. Then I saw that the Color Tattoo range now come in a crayon form (!!!!!!) so of course I had to test one of these out, this shade is Lavish Lavender. I'd been looking for a bright, teal liner to use on my lower lash line for a while and the Lasting Drama Waterproof Gel Pencil in Silken Turquoise looked fit for the job and I already know I'll love this as it swatches amazingly!! I bought three of the Loreal 24 Hour Infallible Eyeshadows which I've been wanting to test out for bloody ages now. They're a pressed pigment and the colours come out beautifully, I can't believe these are drugstore. I got the shades Golden Sage, Bronzed Taupe and Amber Rush. Finally, I got the LA Pro Concealer as I have heard so many things so I wanted to put it to the test!